When you're building nanostructures, the position of each and every atom counts. After all, that's one of the factors that determines, for example, whether a material will be a semiconductor or an insulator, or whether it will start up a process or stop it. But our current imaging techniques aren't precise enough yet to give us full control over nanomaterials. Researchers are working to combine tools we have with new approaches to the data they yield to develop atom maps. Pretty cool. Smokejumpers: They're not your grandma's firefighter...though they have been around awhile. As fires continue to rage in the forests of California, I thought I would introduce you to some of the people trying to control them. Smokejumpers are the logical people to start with as they are usually the first on the ground. Smokejumpers are the elite forces of the US forestry department. 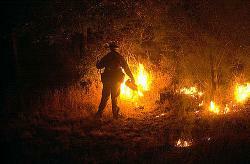 Many fires begin in locations inaccessible to the standard means of transportation (trucks, helicopters, or by foot). These firefighters arrive by plane and parachute into remote areas. Often their landing site is the top of a tree or a boulder field. Their kevlar suits provide some protection but their skill set includes tree climbing, practiced falling and general hardiness. In the beginning, jumpers were required to be unmarried without dependents. They had to be a bit reckless to be able to agree to jump out of a plane into a fire area! Despite the inherent danger of jumping, there have been relatively few fatalities in their long history. Jumping began in the late 1930s as flight technology and airplanes became more sophisticated. During the war, many of the jumpers were conscientious objectors to WWII. In 1981 the first women were allowed into the program. Today there are 9 active bases in the West but they serve fires from Alaska to the North East. The physical requirements... 7 pull ups, 25 push-ups, 45 sit-ups, and a 1.5 mile run completed in under 11 minutes---all done in one session with a 5 minute break between each activity. So, I am pretty much disqualified right off the bat with the pull ups and even if I were to manage, the running would definitely eliminate me. I view running as a self destructive behavior (who would put themselves through that? sorry El). You must also be mentally and emotionally stable--that is a requirement! A smokejumper’s pack often weighs upwards of 100 pounds...and you have no ride out, you must hike or hitchhike in (after landing) and out of the fire. To see a complete list of physical requirements (including height and weight) check out the West Yellowstone smokejumper website. What they do : After landing and recovering their gear (which is dropped from the plane in (hopefully) a relatively similar location to where they land) the crew sets out towards the fire. They carry no water save for their thermoses. They control the fire by either creating a fireline/firebreak, a swath of land around the edge of the fire cleared of any brush or fuel that could feed the fire, or they light a backfire . Backfires act much like a fireline/firebreak in that they burn towards the oncoming fire. By doing so, they remove the fuel the fire needs to continue burning. Only if the jumpers are unable to contain the fire are reinforcements called to the scene. Jumpers direct helicopters to drop water on hot spots and systematically work their way through the burn site feeling the ground to make sure that there will be no flare-ups. They can leave when the fire is controlled or fresh firefighters take-over, often times many hours after they first jumped from the plane. Be sure to check out the links below. Jumpers work from June-Oct so those of you looking for adventure with an extremely selective and tight-knit group, smokejumping could be for you. Orangutans have learned to do things I can’t. Observed spearfishing, swimming. A turtle whispers its secrets to the orangutan: Unfortunately, all the turtle's secrets are about shoplifting and dirty magazines. Orangutans already know about that stuff.Courtesy steven2005Just kidding, I can swim. Not very well, but I swim all right. As far as spearfishing goes, though, I couldn’t do that. I mean, maybe it’s just me, but I could never kill a fish with a stick. Unless it was lying on the ground, or something—then I bet I could really bash the heck out of a fish. I’d really whack its little head in. Orangutans in a conservation refuge on Kaja Island in Borneo, however, have proven to be adept at both swimming and killing fish with sticks. Neither activity was thought to be possible for the great apes, but naturalists on the island have recently observed them swimming across a river to get at their favorite fruits, and using tree branches to stun fish in the water before eating them. Other orangutans were seen attempting to spear fish with branches, supposedly after seeing fishermen using rods. 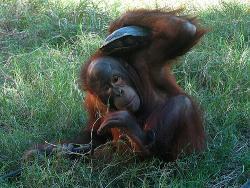 This is thought to be the first documented occasion of orangutans using tools for hunting. It was also noted that some of the apes quickly came up with an even more efficient way of collecting fish: stealing them from human fishermen when their lines were unattended. Those damn dirty apes! Tooling around: A study being conducted in New Caledonia has video footage of crows using twigs and grass to make tools to gather and process their food. (Photo courtesy of the U.S. Fish and Wildlife Service)I’ve seen films that show chimpanzees using sticks and stones as tools to get and process their food. The narrators always say they’re the only animals to use tools. Now comes research from New Caledonia, with video to boot, that shows crows make and use tools in their everyday life. Researchers have mounted tiny video cameras on the tails of crows in that area to record their activities. The footage has even shown the crows manipulating twigs or grass stems to use as tools for gathering their food. 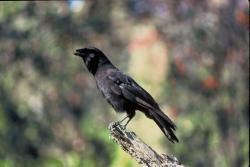 Earlier research showed that crows did use twigs or sticks to dig around for bugs or grubs in dead tree trunks. But new evidence from the video cameras shows that the birds also use grass-made tools on the ground to dig around in bird and animal nests on the ground. In lab settings, crows have been observed bending wires into tools that they can use to get food. With the new footage, scientists now know that the birds actually use those behaviors in the wild. The lightweight cameras, just 13 grams, are attached to the tail feathers of the birds. And they actually do modifications to the twigs they select to be their tools. The crows will break off portions of the twig, smooth the surface for bend it into a hook shape to suit their work purpose. And tools that they really liked were kept for future use. The next big question for these crow scientists to answer: what were the evolutionary factors that have allowed crows to develop this talent and not other birds? Do you have any ideas? Share them here with other Science Buzz readers. This artifact was the first of the about 50 found near Walker, Minnesota. : Photo courtesy Leech Lake Heritage Sites Program.During a routine survey of a road construction site near Walker, Minnesota in 2005, archeologists discovered a flake of stone that appeared to have been intentionally chipped from a larger rock. Over the next couple of months digging continued at the site, and some 50 artifacts, thought to possibly be crude stone tools used for chopping, cutting, or scraping, were found. Initial studies on the stones indicate they are between 13,000 and 15,000 years old. This is potentially significant, as humans are not thought to have populated the Americas until 9,000 years ago. Could humans have lived in Minnesota 13,000 years ago? If the artifacts are 13,000 year old stone tools, it would be the first indication that humans lived in North America during the Pleistocene – from 1.8 million years ago to 11,500 years ago. Some researchers have suggested that the part of Minnesota where these artifacts were found may have been an "oasis" at the time—an area free of ice cover, with an access route to the southeast making human habitation possible. 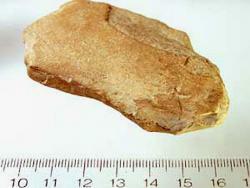 Not everyone who has had a chance to study the artifacts agrees that they are ancient stone tools. Several Minnesota state archeologists argue the stones are the result of natural causes such as glacial movement and flowing water. They argue that Minnesota 13,000 years would have been extremely cold and covered by glaciers and therefore too inhospitable a location for humans to live, and that insufficient time has been spent accurately dating the artifacts. This has not changed the minds of the archaeologists who originally made the finds. They argue that the analysis of the artifacts is still in too early of a stage to make a definitive decision on their authenticity. They plan further excavation at the site this summer and hope to uncover more artifacts to further solidify their claim. Gorilla: A gorilla chewing some food. Biologists working in the rainforest of Africa have documented gorillas using simple tools, such as using a branch to dig for food. For a long time, scientists thought only humans used tools. In 1960, Jane Goodall observed chimpanzees using tools in the wild—the first non-human species known to use tools. In 1993, Caral van Schaik of Duke University found tool use among orangutans on Borneo. Now, we can add gorillas to the list of tool-using primates. Humans and gorillas last shared a common ancestor some 5 to 8 million years ago. Apparently, tool-use evolved sometime before then, and has been inherited by both species. Researchers say this discovery will help us understand the evolution of the human species, and the human brain.